We have decided to include some recipes on the site for those either transitioning off of GAPS or transitioning on. We feel these recipes still embody the spirit of GAPS by focusing on real, nutrient-dense foods as ingredients, but with one or more ingredient that is not legal on the full diet. This delicious and creamy pudding works well as a snack, a breakfast, or even as frosting! Place all ingredients into a food processor and blend until smooth. Taste and adjust flavors if needed. NOTE: The first time you make this, you may want to begin with just the 1/4 cup of honey and carob or cocoa and see how you like the flavor. It is easy to add more of these ingredients later. Oh my gosh. I think I might die. Chocolate pudding?! I am not doing dairy, but dearly love avocados and chocolate pudding was one of my favorite desserts. I am going to have to try this very soon. Thanks for sharing! This looks so good. We love avocados around here (along with all of the other ingredients). Can't wait to try it! Wow Starlene, what a beautiful blog you have! I'm glad you liked it and your photo of it is much nicer than mine :) I also love your idea of making it into ice cream. I bet it would also make great "fudgesicles". Hi Sierra! Thank you! I totally loved the pudding!! To my sugar weaned palate, it was sensational and decadent. It was so creamy, just like pudding should be. I love pudding and have not had any in over a year since I've been on GAPS. I seem to be okay with cacao and cocoa powder so I just had to try it. Totally loved it. Thank YOU for all your great recipes here! I love to make this with one avocado and one banana-yum! Wow, I made this this afternoon, and it was AWESOME! I am not a huge fan of plain avocados, and I had two ripe ones to use up, so it was perfect for this recipe. The thick creamy chocolate totally made my day! :D I made in our Vitamix, and my only complaint was the difficulty getting all that creamy goodness out of the blender without losing any! Have you ever tried making this with an immersion blender? I think I might try that next time, as soon as my new Immersion blender arrives in the mail! :) Thanks so much for this recipe! Absolutely lovely! I made a half recipe, and it was super silky and delicious. any ideas of what i could substitute for coconut oil? i'm dangerously allergic to coconut. You could probably just make it without the coconut oil, or use butter. I think it would be fine either way. This is soooooo good! My family wanted to lick their bowls. Not a smidgen of avocado flavor to be found in it. 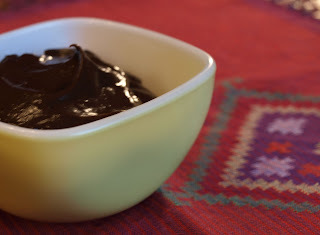 Just luscious chocolate pudding. Thank you! This looks so good. What kind of avacados do you use? The big lighter green Florida ones or the tiny darker Haas? I've always used the Haas, in my opinion the other ones are too watery. I suppose it could work with either though.